The journey from Chichester to Victoria was uneventful but I continue to be amazed at just how much unspoilt countryside there is outside the main centres. We passed field upon field of crops, some flourishing, others looking a bit tired for lack of rain. We would then approach a town and suddenly, the glorious countryside disappeared and the houses were very close together and there was evidence of lots of small industry. I found Victoria Station to be a bit of a disaster if truth be told. There is no allowance for disabled people, there are far too many steps, and the station concourse is absolutely vast. I can't even say how vast because it's completely impossible to see from one side of it to the other! Nevertheless, I managed to find my way to the Underground and begin my journey to West Brompton tube station, near Earls Court. Some of the tube lines don't have air conditioning and there were constant warnings over the loudspeakers for everyone to carry water and to get off the trains if they felt unwell as they would be easier to help on the platform. I didn't have to get off any of the trains, but I must say that I was very hot and tired from trundling my case along various platforms, up and down too many flights of stairs and along pavements in the scorching heat. 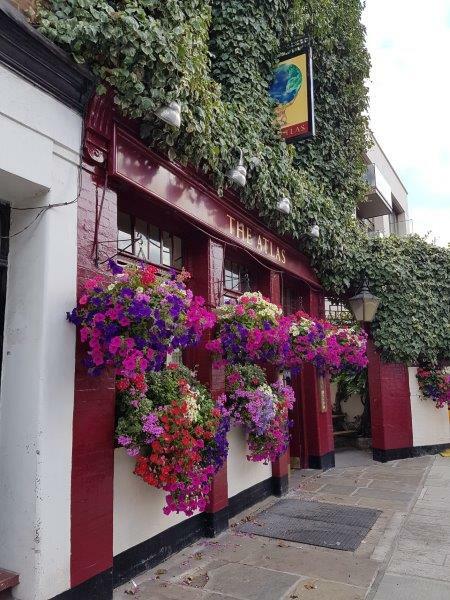 It's not surprising that I stopped for a breather at the end of Elissa's road to take a photo of this delightful pub frontage with the ubiquitous hanging baskets (though how they keep them watered in the heat, I don't know). It was 37 degrees that day! Elissa was in very good form when I finally arrived at her apartment in West Brompton, There was just time to cool down with a cold shower before we set off (thankfully with an Uber driver - my first experience of using one) for a lovely evening out together. 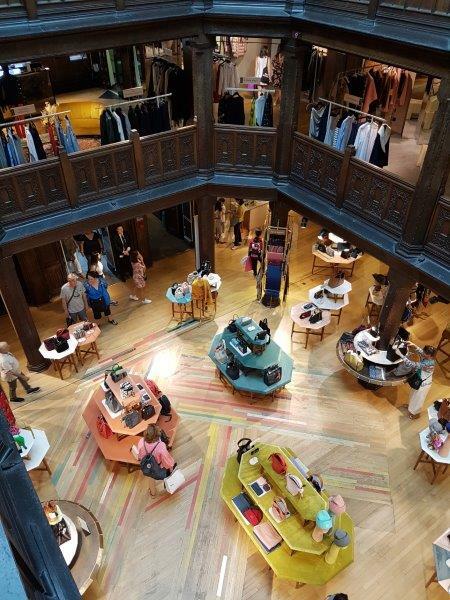 Our first stop was at Liberty London, a very old department store in Regent's Street where Elissa's lovely younger sister, Sheila, joined us for a drink to start our evening out together on the right note. I had forgotten how old the interior of the building still looked, probably because the last time I shopped there was about fifty years ago when it wouldn't have appeared so old. Although I actually didn't fancy anything on the racks as we made our way to the restaurant on the second floor, the layout was nevertheless rather attractive, if a bit quaint! One bottle of South African Pinot Gris demolished (sacrilege but there wasn't a New Zealand wine on the menu!) 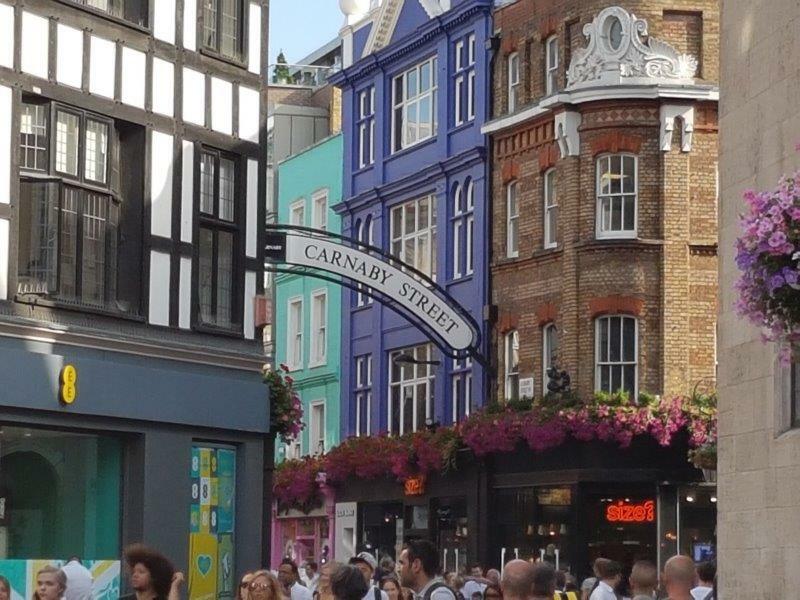 we made our way pretty slowly to a restaurant near Carnaby Street called Blanchette. The pavements were crowded, mostly with younger people, and the atmosphere was pretty festive. The restaurant was one of very few in that area serving early pre-theatre 'snacks'. The performance we were going to started at 7.30 pm and most performances in London start an hour later so we were lucky to be offered such delicious things as Tuna Tartare with Aubergine, Thyme and Smoked Aioli. 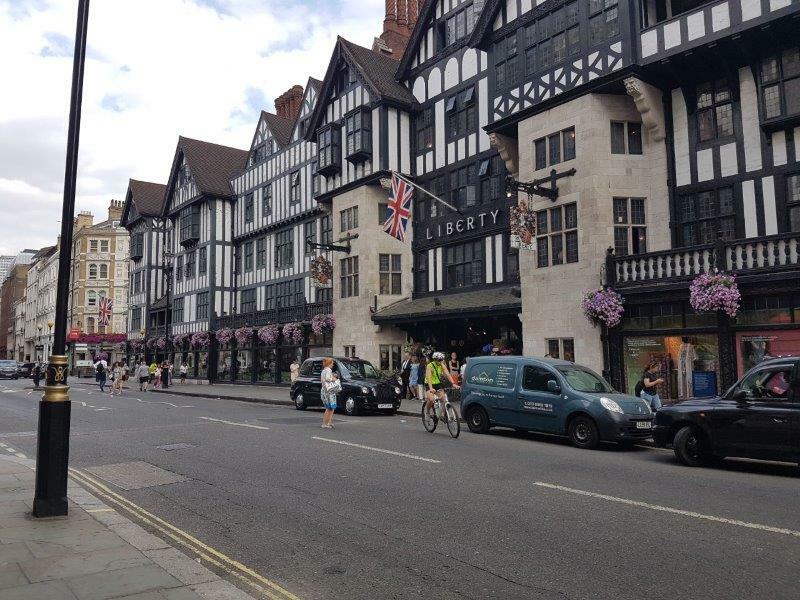 The food was extremely good and served very quickly which was just as well as we had to walk all the way back past Liberty and then a little further still to reach the London Palladium - and I think the temperature was still about 37 degrees! What a treat! Elissa had managed to acquire tickets to see a performance of 'the King & I". I had seen Yul Brynner and Deborah Kerr in the title roles in the late 1950s so was full of anticipation to be seeing the show again with a completely different cast. It was captivating and the singing and choreography were outstanding. 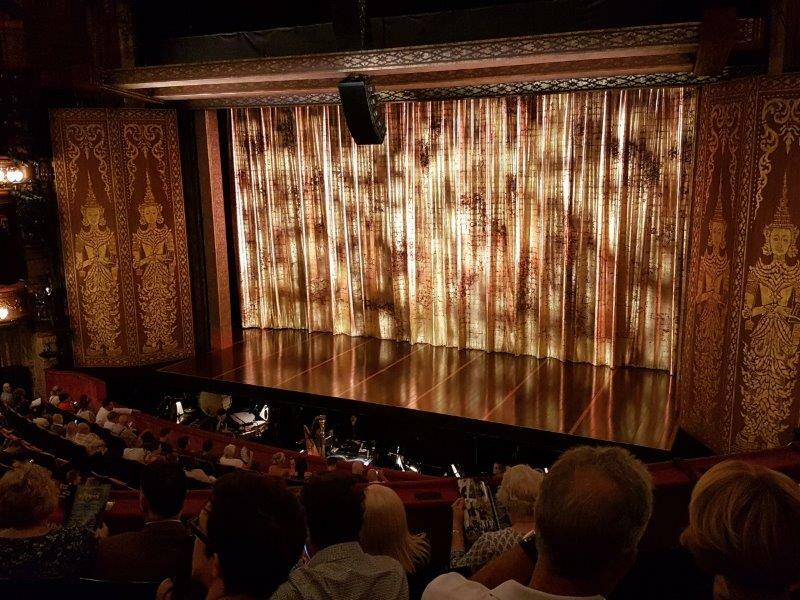 Just as the show was about to start, we were told that photographs were not allowed but I'd already managed to take this one of the stage with the curtain down so that will be a lovely memory of the evening. We spent the following day very quietly after so much excitement. It was really too hot to go out on the busy London streets and we had so much news to catch up on and a few household chores to attend to. And the next day I was off again, this time for my last 'adventure' before beginning my journey home. I was on my way to Broxbourne, our home in England for many years before we came to New Zealand. Original generation time 1.4993 seconds. Cache Loaded in: 0.0249 seconds.